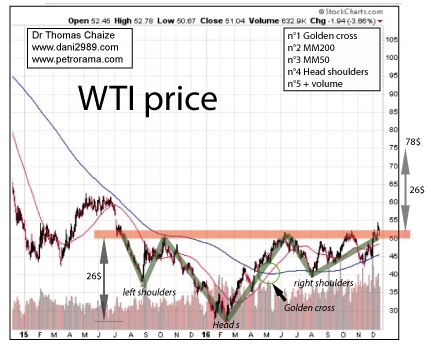 The price of oil : 5 bullish signals! N ° 1: The price of oil is above its MM50 (short term). 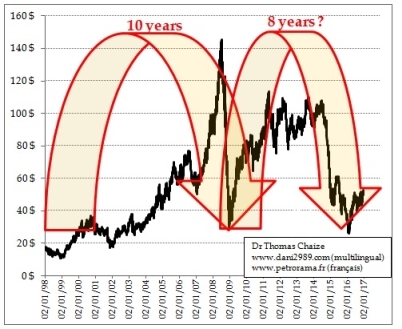 N ° 2: The price of oil is above its MM200 (long term). N ° 3: A golden cross: passage from the moving average to 50 days (MM50) above the moving average to 200 days (MM200). N ° 4: An inverted shoulder head (you have to pass the neck line to validate the figure). N ° 5: increase in volumes. Downward there are three supports: No. 1 neckline in the $ 50 area, No. 2 the MM50 and No. 3 the MM200. If the three supports drop we would probably go from a rise period to a horizontal stagnation. If we go back to 1998, the last major trough, it gives the impression that we are close to a trough that occurs every 8/10 years.